Wharton Esherick’s Three-Legged Stools are some of his most iconic and recognizable pieces. 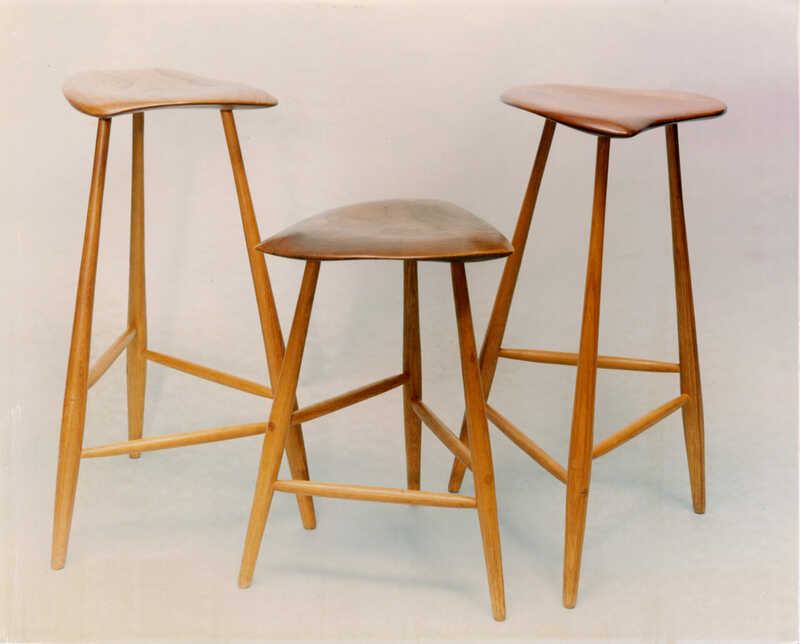 He began producing the stools in the 1950s to supplement his income between commissions by producing affordable pieces using leftover scraps of wood which he could keep on hand for quick sales. 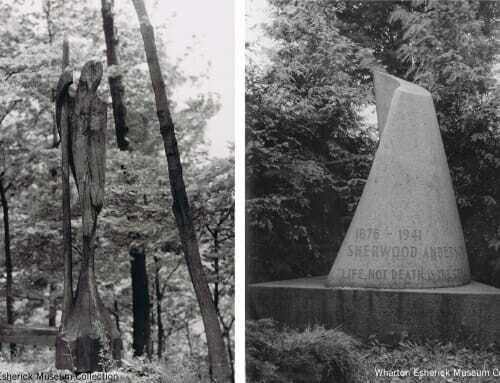 Esherick had plenty of scraps laying around his studio; if the wood grain in a piece of scrap was too beautiful to be burned, it got tucked away in the woodshed for later use. He also used those scraps to create beautiful cutting boards, which he’d often gift to friends and family. 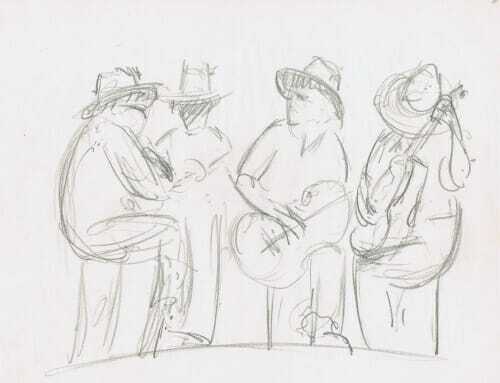 The Three-Legged Stools are an excellent example of Esherick’s functional art. Not only are they beautiful and eye-catching, but if you’ve ever had the opportunity to sit on one, you’ll know just how comfortable they are as well. Another perk: they’re lightweight, so anyone could easily move them from place to place. 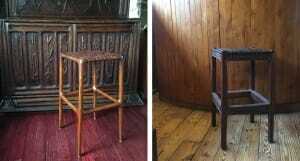 Wharton wanted the legs to be slender, so the stools would be lightweight and delicate in appearance. He gently tapered the round legs to rise from almost a point on the floor, swell in the area of the stretcher attachments, and then taper again toward the seat. To avoid weakening the spindly legs, he offset the dowel-like stretchers at three heights. Initially, he carved the legs and stretchers with a spokeshave in the studio but, in time, he let John Schmidt turn them on his lathe; the legs would all be alike, but each of the seats, which Wharton continued to shape by hand, would be as unique as its grain. 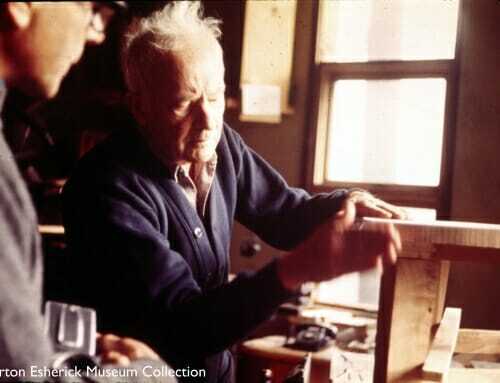 Initially, Esherick sold his three-legged stools for $25, making them easily affordable for many who could not afford his larger works, though, by the 1960s, he had raised the price to $50 each. The stools came in two heights: 18 or 25 inches. He received several inquiries about special made-to-order heights but noted to the potential buyer that custom sizes made the stools a commissioned work, and quoted each stool at $250-$300. In 1968, Esherick was approached by the Armstrong Linoleum Company, in Lancaster, PA asking to use his stools in an advertisement for their new, groovy, linoleum floors (okay, groovy is our word for them, not Armstrong’s). The advertisement was printed in Women’s Day, Better Homes & Gardens, McCall’s, and Ladies Home Journal and ran over several years in a few different iterations. 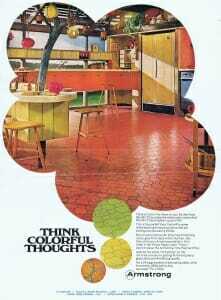 In one advertisement, several of Esherick’s stools are seen in a modern kitchen with bright orange linoleum floors, seen here to the left. Something interesting we noticed about this ad: there are little metal feet on the bottom of the stools which have us wondering who did that, and what did Esherick think of it?! The second ad, seen to the right, was a two-page spread on the inside back cover of the magazine, showing a single Esherick stool (sans the metal feet) below the counter of a country-style kitchen. 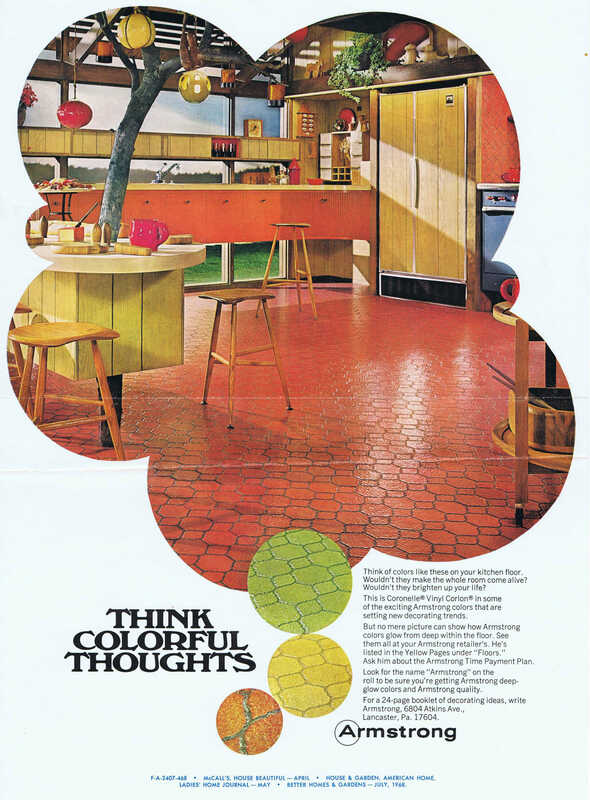 The advertisement proudly announces that any room becomes “the sunshine room,” when you add Armstrong’s new padded linoleum flooring in bright, cheery yellow! 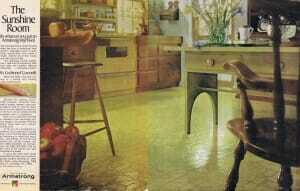 Esherick’s stools looked fantastic in both kitchens which appealed to many viewers of the ad. 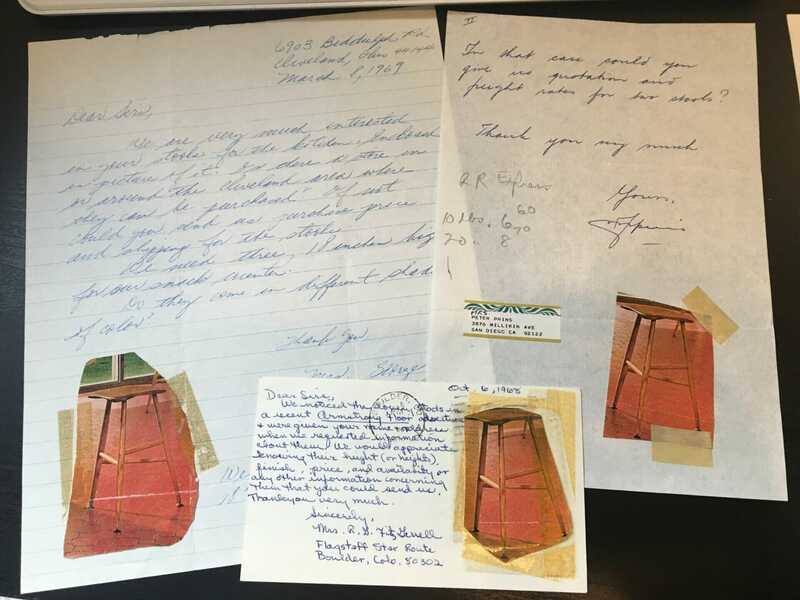 As a result, people began contacting the Armstrong company asking for the contact information for the artist who “made those beautiful stools.” Esherick received dozens of letters from people inquiring about purchasing his stools from all across the country including Alaska, Georgia, Nebraska, Massachusetts, California, Ohio, and New York. 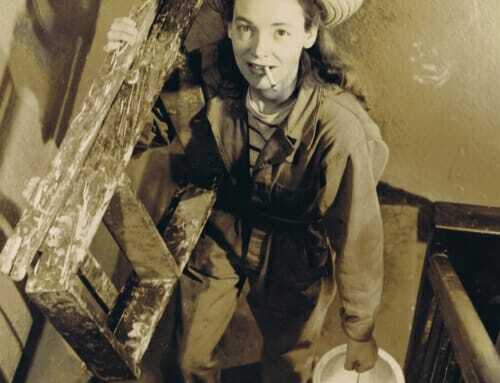 Esherick, and later Miriam Phillips, would answer each letter, letting the potential customer know what was available, how much each stool cost, and on several occasions letting designers know very pointedly that he was not a mass production studio! Letters to Esherick asking about his stools. It is estimated that Esherick sold about 300 of these stools over the twenty years that he was making them, most of them dating to the 1960s. 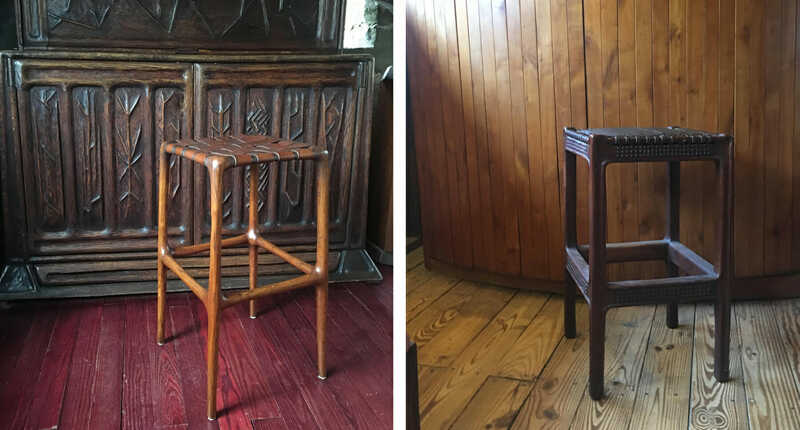 While $60 for one of these stools is a steal today, the secondary market sees Esherick’s three-legged stools on a regular basis – if you’re in the market! A few years ago, an Esherick stool made an appearance on Antique’s Roadshow, which you can view here. The owner had considered selling it for $30 at a yard sale and was very glad after she learned the appraisal price of $2,500 that she had not! We’ve even heard a few stories from visitors about finding one at an antique shop or inheriting one from a relative and not knowing what it was, they just liked it and enjoyed using it until someone pointed out to them who it’s maker was! 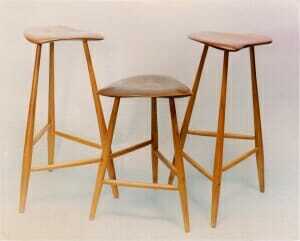 While the Three-Legged Stools are the most iconic, Esherick created several different stool designs over his career. We’ve got a few on view in the Studio you can look for on your next tour! Esherick’s 1929 Desk Stool sits next to the carved Drop-Leaf Desk (bottom left image) and in Wharton’s bedroom, you can spot the Carved Stool (bottom right).